Lock in a great price for Bill & Coo Suites and Lounge -The Leading Hotels of the World – rated 9.4 by recent guests! The staff were very friendly, smiling and helpful A mobile was given to us to use during our stay to contact the reception 24/7. Rooms were spacious and clean. The main pool at night has little stars in it, we stayed in the honeymoon suit it was nice and the one with the private pool both were nice. They gave us a mobile to contact the reception if needed at anytime out of the hotel. All staff were very friendly, smiling and nice. We stayed in two room categories both were nice. Good range of breakfast choice. Romantic at night the pool area becomes a lounge. Music is good. The stunning sunset view from the pool lounge....the beautiful swimming pool that lit up on an evening....our room was beautiful and clean and staff often ensured your water glass was constantly topped up so you stayed hydrated while relaxing by the pool or at the bar. Everything ! If you've ever wondered what it feels like to be treated like royalty, book a stay here. It begins with being picked up in the hotel's BMW X5 complete with cool face towels & water. The staff are so kind & friendly. The property itself is stunning & the rooms are immaculately clean. When you sit by the pool, the staff bring you complimentary water & they make the best cocktails ! We did not want to leave. I've traveled the world both for business and leisure and this is the most amazing service ever and I mean ever !!! You feel like having a team of personnel staff at your disposal 24/7 and they are so friendly and kind and its all coming genuinely from their heart. A truly divine and unforgettable experience. I'll be back in a heart beat. The facilities were beautiful. Our suite had an amazing view and a personal hot tub. We were given a cell phone so we can reach the front desk at anytime for everything from water to a ride back from the city (which came in VERY handy). The staff was wonderful - always smiling, always ready to help. Bill & Coo Suites and Lounge -The Leading Hotels of the World This rating is a reflection of how the property compares to the industry standard when it comes to price, facilities and services available. It's based on a self-evaluation by the property. Use this rating to help choose your stay! One of our top picks in Mikonos.The 5-star Bill & Coo offers sea-view suites, Mediterranean flavours and an infinity pool with views of the bay. 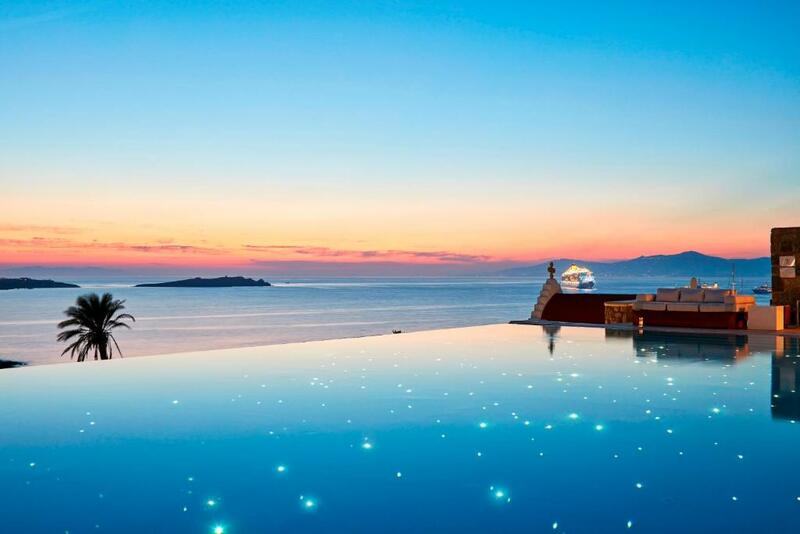 Situated on Megali Ammos Beach of Mykonos, it is a member of the Leading Hotels of the World. Bill & Coo’s luxury suites feature contemporary design and modern bathrooms with walk-in shower. 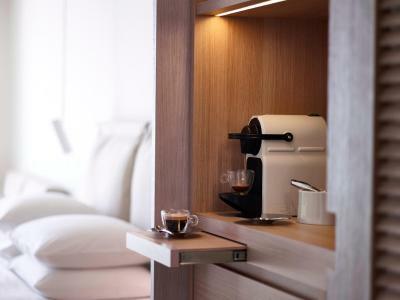 Each is equipped with free WiFi, satellite LCD TV and working desk. Some rooms include an outdoor hot tub. The new coastal suites are located in Agios Ioannis, at the Bill & Coo Coast adults-only complex, 1.9 miles from the main complex and 3.5 from Mykonos town. The hotel's awarded fine dining restaurant is situated by the pool and offers sea views. It serves a Mediterranean creative cuisine based on seasonal local products. Signature cocktails and refreshing drinks are proposed at the lounge bar. Beauty treatments and massage are available at the New Spa by Valmont as well a brand new gym in the spa area. The hotel offers a great array of services including round-trip transfers to Mykonos Airport and port. 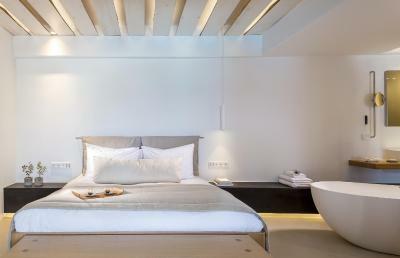 Bill & Coo is conveniently located 10 minutes walking distance from Mykonos Town. It is 1.6 miles from the Mykonos Airport and port. When would you like to stay at Bill & Coo Suites and Lounge -The Leading Hotels of the World? Spacious suite featuring 2 bedrooms with attached bathroom and a spacious balcony with panoramic sea and sunset views. Please note that the fifth person will be accommodated in a sofa bed. More spacious suite with outdoor hot tub and sea views. Please note that the third person will be accommodated in a sofa bed. Featuring a spacious balcony with direct sea views, this suite is minimally designed and includes smart home automation system. Featuring a private pool, this suite offers sea views and includes a mini-bar, satellite flat-screen TV and a steam shower. The Sea View Coast suites are located in the Coastal part of Bill & Coo, in Agios Ioannis, 1.9 mi from the main complex. This open plan suite on the upper floor of the building opens out to a balcony overlooking the Aegean sea and Delos Island. The Bachelor Coast Suites are located in the Coastal part of Bill & Coo in Agios Ioannis , 1.9 mi from the main complex. This suite features beautifully appointed interiors with separate bedroom and seating area on the upper floor of the building and panoramic views of the Aegean and Delos Island. The Deluxe Coast Suites with private outdoor hot tub are located in the Coastal part of Bill & Coo in Agios Ioannis, 1.9 mi from the main complex. This open plan suite is set on the ground floor of the building and opens out to a terrace with sunbeds and a private hot tub with stunning views of the Aegean sea and Delos Island. The Honeymoon Coast Suites with private jet plunge pool are located in the Coastal part of Bill & Coo in Agios Ioannis, 1.9 mi from the main complex. Set on the upper floor of the Building, Honeymoon Coast Suite opens out to a private balcony with outdoor jet plunge pool. Offering privacy and intimacy, it consists of a separate bedroom, a seating area, a walk-in closet, and a spacious bathroom. Bill & Coo Coast Suites with private infinity pool are located in the Coastal part of Bill & Coo in Agios Ioannis, 1.9 mi from the main complex. This suite offers comfortable outdoor lounge with stunning views of the Aegean sea and Delos Island. Offering privacy and intimacy, it consists of a separate bedroom, a seating area, a walk-in closet, and a spacious bathroom. House Rules Bill & Coo Suites and Lounge -The Leading Hotels of the World takes special requests – add in the next step! Bill &amp; Coo Suites and Lounge -The Leading Hotels of the World accepts these cards and reserves the right to temporarily hold an amount prior to arrival. Bill & Coo Suites and Lounge -The Leading Hotels of the World accepts these cards and reserves the right to temporarily hold an amount prior to arrival. Please note that for group reservations of 4 suites and more, different policies and additional supplements may apply. Please inform Bill & Coo Suites and Lounge -The Leading Hotels of the World of your expected arrival time in advance. You can use the Special Requests box when booking, or contact the property directly using the contact details in your confirmation. Outstanding service and responsiveness. Hotel manager went above and beyond to make us happy. Would highly recommend! Beautiful hotel and excpetional staff. We loved our stay there! The atmosphere was spectacular and the staff treats you like royalty. We loved everything about our week at Bill and Coo it was perfect. The hotel is beautiful. The service and staff make this hotel it is impeccable nothing is too much trouble! Gym was too small and no beach with the hotel. Everything. The staff were exceptional. The food was divine. Attention to detail was faultless. A true 5 star leading hotel of the world!! The meticulous attention to detail was amazing. We were extremely well taken care of. From the chauffeurs who picked us up from the airport and ferried us everywhere to the front office staff who made our reservations for meals and excursions to the waitresses we felt that we were with old friends rather than at a hotel. Artemis the Front Office Manger and Matilda the Concierge were amazing with our 2.5 year old daughter. Thank you all for a wonderful stay. Luxe room and staff were incredibly helpful and friendly. It’s a 10 minute walk into Mykonos Town. The staff were super friendly. Rooms were so nice. Lounging area was so cozy and nice. Location, view., room.... And especially the staff, really amazing, we spent one amazing week there, thank you so much!!!! We were in the Bachelor Suite, stunning. We have been in many 5* hotels, and this one is one of our favorites one.